Budgeting can be a roller-coaster. One day, you’re on top of bookkeeping. You organized your receipts, your credit card is paid up, and you have a nice buffer of savings in place. But the next day, everything starts to go downhill at a rapid pace. Your hands may not be in the air, but there’s definitely a lot of screaming when you overdraw on your account. If you don’t stick to your budget every day, you’ll always be rolling from low to high…and back to low again. The solution is easy — find a budget management app that works for you. One with an interface you love (because if you dread using the app, that defeats the purpose). And it should work seamlessly with your project management tool, bookkeeping software, or payment processing system. Fortunately, I’ve got two apps up my sleeve my clients love for both business and personal. Raise your arms! It’s time to upgrade your business skills. Mint, owned by Intuit (which is the same company as Quickbooks) is super user-friendly. It allows you to see ALL your finances in one place. You can create a budget (that fits your lifestyle), check your credit score, and pay bills. The app will notify you if there’s unusual spending or if you are spending too much. This accountability can help you consider unnecessary sending. Like, that new Instagram course or new planner is worth the hit on your account. It syncs with almost any financial institution. For example, your 401K account (like Fidelity), your bank account, brokerage accounts, or an IRA. We recommend the app to our clients who need to know the state of their finances. But, also if they want to create a salary for themselves (we talk about that here). Quickbooks Online is near and dear to our hearts. It’s the software we use to securely handle our clients’ day-to-day financial tasks. Like any robust accounting system, there’s a bit of a learning curve. But with plenty of tutorials online (and a little patience) the capabilities are well worth the investment. Similar to Mint, you can connect your bank account and manage your budget. BUT, you can also track mileage, create invoices and payments, and maximize your tax deductions. Our favorite feature is the ability to run reports to review profit, loss, and expenses. There are different pricing plans, from $5/month up to $35/month. The plan you need will depend on where you are in your business growth. But we recommend at least getting Simple Start (which syncs with a really cool project management tool called HoneyBook). When you upgrade your bookkeeping routine with one of these apps, you’ll be less likely to overspend, overdraw, and overstress. 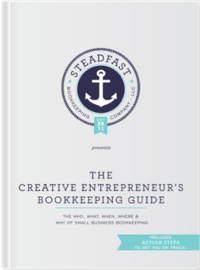 You’ll run your business like a boss — and feel like one too! So, tell us, where are you keeping your business receipts right now?